There are many options available to those who are struggling with debt. One of your options is to declare bankruptcy. Another of your options is to look for a qualified credit counselor. Which of the two options would work best for you? Let’s take a look at declaring bankruptcy versus going to a credit counselor. Why Would You Declare Bankruptcy? Bankruptcy is an attempt to have your debts legally discharged. Having your debts discharged relieves you of an obligation to pay your past due balances. 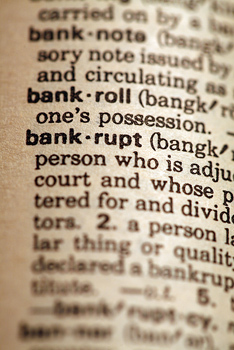 Debtors can choose to file for Chapter 7 bankruptcy, which is a liquidation of your debts. Your other option is to file for Chapter 13 bankruptcy, which is a restructuring of current debts. The type of bankruptcy you declare will be decided by a judge. Your best option is to be approved for Chapter 7 bankruptcy which completely discharges your debts. Filing for bankruptcy as a way to obtain debt relief can be an option for those struggling with secured debts. Debtors who have an auto loan, mortgage or second mortgage can find relief through bankruptcy protection. Your creditors are unlikely to settle secured debts through consolidation. Why Would You Choose Credit Counseling? Credit counseling is your best option if you are serious about getting rid of your debt. A qualified credit counseling service can help you restructure your debt without serious consequences for your credit score. The trick is to find a credit counselor who will care more about your needs than your money. A credit counseling service will set up a debt management plan for you. Debt management plans will not lower your interest rates or your balance. However, following your plan allows you to get out of debt on your own. You will not need settlements or negotiations. Working with a third-party credit counseling service has other benefits as well. You will no longer have to deal with creditors contacting you regarding your debts. This is because your counselor will now have power of attorney over your debt. Enrolling with a counseling service also shows creditors you are working on paying back your debts. Your creditors will go easier on you if they see you are working on paying your outstanding balance. Bankruptcy has the most impact on your credit compared to other debt relief options. Your credit is going to be shot for at least a year. This is because your credit score is going to drop at least 100 points simply for having your filing approved. Lenders will also be able to see this on your credit report for 7 or 10 years based on your type of filing. Another side effect of bankruptcy are the inaccuracies that may remain on your credit report. Creditors may not always correctly report your accounts as discharged. An outstanding balance may remain unless you check your credit report immediately after your bankruptcy goes through. Debt collection agencies may see this outstanding debt on your credit report. This could trigger more phone calls, letters and trips to court. Bankruptcy will do you no good if it won’t help you start the process of cleaning up your credit. You are the only one who can take action to make sure creditors live up to their end of the bankruptcy agreement. Going to credit counseling will do mostly good things for your credit score. Opting for a DMP will increase your score because you are finally making your payments on time again. You also avoid your creditors noting your use of a debt relief service on your credit report. Even if they do, FICO will ignore this when calculating your credit score. Credit counseling can be a boon for those who have poor credit scores. Your old accounts will be brought back to current under the terms of most plans. Clearing up past due bills can raise your credit score fast. Getting accounts out of collections raises your score even more. Lowering your debt-to-income ratio is another way a DMP will help you out. Credit utilization levels will also go down as you repay your credit debts. You can see how using a credit counselor can have many positive benefits for your credit score. Credit counseling is an option for debt relief. You can have your secured debts included in any DMP you enroll in. Credit counseling leaves fewer long-term marks on your credit report. Bankruptcy should only be used when you have gone through the other credit solutions. There are many ways to reduce your debts. National Debt Relief offers a free debt analysis to go over your choices. Adam Tijerina is a personal finance expert for National Debt Relief, a BBB A+ accredited business offering debt settlement services since 2009. Adam knows a thing or two about debt resolution after successfully settling $43,250 in credit card debt on his own. He has also co-authored two books about overcoming adversity and has been featured on Credit.com and USNews.com. Adam holds a Bachelor’s Degree from Trinity University and lives in Texas with his wife and four children.